We went to the District of North Vancouver (DNV) Council Meeting last Monday to present on the merits of supporting more community garden development, and to report on the success of the newly built Lillooet Park Community Garden. The agenda was stacked with food related presentations – the Edible Garden Project, Delbrook Staff Garden Initiative, the Youth Safe House Secret Garden, comments on Metro Vancouver’s Draft Regional Food System Strategy, and the results of a survey on Neighbourhood Perceptions of Local Food and Gardening. We are so thank-full that over a dozen people came out to support and speak about community gardens. Having so many warm bodies and different perspectives on why community gardens are important for DNV residents made a real impact! The animated and heartfelt descriptions of the joys of lugging rocks during the hottest days of the year during the construction of the Lillooet Park Community Garden, meeting new neighbours and friends, and getting a chance to learn new skills showed Mayor and Council the diversity of reasons why the community supports more gardens. At the end of the evening Councillor Lisa Muri said, “I am no longer a skeptic on the value of community gardens and what they mean to residents of the North Vancouver District.” That’s a big step forward, and we were happy to also hear support for community garden initiatives from Mayor Walton, Councillor Hicks, Councillor McKay-Dunn, and Councillor Nixon. As Mayor and Council discussed a number of items on the agenda Heather and I found ourselves scribbling notes and biting our tongues. Sometimes it’s hard not to interject and add your own thoughts to the discussion! Instead of getting kicked out of Council Chambers for disrupting decorum, we decided to save our thoughts to share in writing today. What is the distinction between neighbourhood gardening and large scale “food security”? One of the interesting points that was brought up a few times by Counc. Little is the notion that neighbourhood gardening does not impact food security. We beg to differ, and I think there are a few other members of Council that would agree there is a very real and tangible connection. If we’re talking about food security on an individual basis then we cannot assume that everyone can afford to have access to fresh healthy produce all the time. In fact there are many people on the North Shore who would benefit to access to a community garden plot to grow nutritious and culturally appropriate food for themselves and their families. Gardens provide people with access to grow safe, nutritious, culturally appropriate food even if they don’t provide all of the food they will need. Counc. Hicks mentioned the role that Victory Gardens played in providing families with food in England post WWII. Community gardens will need to play a similar role again in the future as food supply decreases and costs increase due to climate change. We are several generations removed from our agricultural roots and need to re-build the capacity and knowledge on food growing within our communities if we hope to have the same success of past Victory Gardens. Community gardens provide the perfect learning environment and hosts for workshops and training sessions available to everyone in the community to revive those lost skills. Community gardens are not the end all and be all of food security for the North Shore, but they are a more than simply recreational and therapeutic. They are one vital component of a diverse strategy that helps move us towards a resilient and sustainable food secure community. Whose responsibility is food security? During the discussion of the Metro Vancouver Regional Food Strategy draft, Counc. Muri and Bassam were both supportive of the strategy’s proposal to preserve Agricultural Land Reserve (ALR) land. This is great, but there is no ALR land in the DNV. Although I’m happy to see them jump on board the preserving ALR lands, their support for something that has little to do with food security or production in the DNV is not a replacement for “home grown” initiatives on the North Shore. A regional strategy for food security is incredibly important, but I think that a perspective that focused more on “what can we do to support this…” rather than “Metro Van should…” would do wonders. Passing the cost of community garden building over to community members would defeat the purpose of accessibility, and it is unrealistic to rely solely on businesses to sponsor community initiatives like this. However there is room for the DNV Council to address what their role is in supporting community garden development without being responsible for paying for them all. The upcoming Official Community Plan (OCP) is a great opportunity to encourage or require all new developments to include community garden space. If the District is not going to support garden development financially, why not include them as a community amenity to be provided by developers. As the ‘Network of Centres’ proposed in the Draft OCP is developed increasing density is only going to mean increased demand for garden space: building them in as these centres develop is going to be much easier than trying to add them later! Community Gardens are not Cost Effective? When it comes down to cost, I just don’t see how an elliptical machine offers more value to the community then a community garden – that’s an argument we’re hearing from some Council members! Although a gymnasium may see over 200 people in a month, there are construction, staffing, maintenance, electricity, etc. costs to consider over the lifetime of that infrastructure.. Gardens on the other hand are a onetime construction cost (the garden society takes care of ongoing maintenance), and provide a public space and learning environment for the entire community. In fact, the District is saving money every year by no longer having to maintain the garden site. I think that if you compare the cost of each over 20 years the garden might not seem so expensive! Both have value from a recreation perspective, but both appeal to different folks as well – I’m personally not a community member who gets any use out of an elliptical machine! Here’s the video we created to thank Mayor and Council for their support of the Lillooet Park Community Garden. Tonight the District of North Vancouver’s Mayor and Council will debate the merits of a proposal for two farmers markets. The two proposed locations are at Lynn Valley Village Plaza and Parkgate Plaza, and would run for a trail period of one year. The proposal on the table tonight would authorize staff to modify special events permits to allow for events like a farmers market on public lands. There’s nothing like buying your fresh produce from a local farmer – the person that put in the sweat equity to make that carrot so sweet and crunchy! Farmers Markets provide the opportunity to buy fresh healthy local produce, support our local economy, and of course create the connection between food purchasers and producers. I am writing in support of the proposal for the Farmers Market trials in North Vancouver. Farmers Markets provide access to fresh local food, an opportunity to get outside and meet new people, and support our local economy in BC. I would like to see Farmers Markets in North Vancouver, and I hope that you will support this proposal. If you haven’t visited the Food Policy website, it’s worth checking out. There are a few job opportunities posted, as well as a list of volunteer positions. So many ways to get involved! 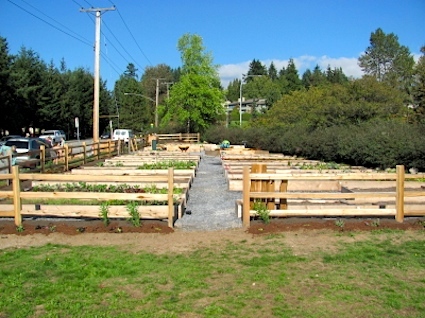 Check out the Greater Vancouver Community Gardens site. It’s a social network for all of us out there involved in community gardens or looking to start new ones. It’s updated regularily, and I think it will make a grea hub for information on Vancouver’s gardens! I’m sitting at the first Vancouver Green Tech Forum. Mayor Gregor Robertson opened the event, and in his address he confirmed that the amendment to the Animal Control By-law has passed! This means Vancouverites can now legally keep chickens in their backyard. I don’t have all the details, but I believe that there is a limit to 2 hens (I could be wrong about this!). There are lots of North American cities that allow city chickens, and there are many benefits. So you’ve got a backyard, and want some urban hens of your own? I just collected a few resources that I thought I would share with you. A friend of mine also just started a Facebook Group that you may want to check out. Chickens in Vancouver will become a place for dialogue on keeping hens in urban Vancouver. Gregor also mentioned the fact that City Hall lawn will be ripped up the Spring to make way for a new community garden! How exciting! This is just the sort of leadership and initiative I’ve wanted to see come out of City Hall. The new garden will be built in partnership with Society Promoting Environmental Conservation (SPEC) – a long standing organization in Vancouver that has done amazing work to make our city greener. This evening Legalizing Backyard Hens was on the list of motions on the City Council meeting agenda, but I’ve heard through the grape vine (and a reputable source) that the vote will actually happen on Thursday March 5th. 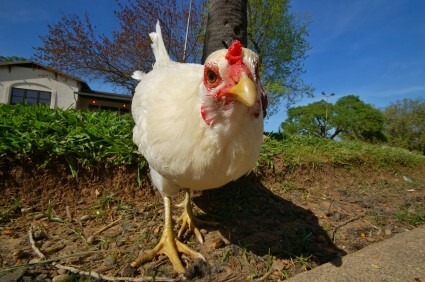 Vancouver media has picked up on the City Chickens by-law in recent weeks. CBC interviewed Heather Jarvey, who is already illegally raising two hens in her backyard. Jarvey scorns charges that chickens are loud and dirty, countering that hens, unlike roosters, make little noise. She added that chickens produce much less waste than dogs or cats, and their manure can be composted… read more. Almost every time I go visit my Mom, she has the newest rendition of the PERFECT chicken coop design. Although she doesn’t live within Vancouver, so the by-law won’t apply, I find her Swiss-army to gypsy caravan style chicken coop designs inspiring…. I could imagine them all in the back yards of my neighbourhood. Go to the City Council meeting on Thursday March 5th. Make a brief address to the Council about the by-law at Thursday’s meeting (please sign-up). Join the Chickens in Vancouver Facebook group. Originally posted on Rocks & Water. Onni Community Gardens Viewed from the Bridge from Michael Levenston on Vimeo. The Vancouver Public Space Network (VPSN) was involved in the initial start-up of the Onni Garden, and now we’re taking on the new garden at the corner of Burard and Davie Street – Davie Street Community Garden. So that means that I’ll be heading up getting this garden off the ground and into the hands of the community. The incentive for developers to start gardens? BC Tax Assessment will asses property taxes at a lower rate if the pre-developed land is being used for a community or public purpose (i.e. a garden).